Like other styling/coachbuilding concerns such as Ghia (Ford) ), Vanden Plas ended its days as no more than a name on the top-of-the-range models of its more mundane products. Vanden Plas was founded way-back in 1884 by Guillaume Van Den Plas and was based in Brussels. By 1913 a British arm to the company had been established in London and it soon began supplying coachwork for manufacturers such as Bentley. 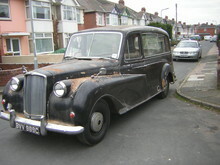 In 1946 the company was purchased by Austin and began making the successful Princess models. 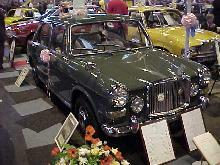 After the formation of BMC (the British Motor Corporation) Vanden Plas found itself becoming an independent "marque". 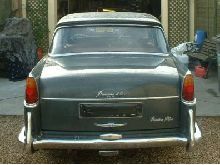 This meant that Vanden Plas could be sold through either Austin or Morris distributors as there were less obvious "political ties" with the old pre-BMC Austin and Morris empire days. Vanden Plas models were always dressed-up versions of other BMC models such as the 1100/1300 range and were hand finished and well equipped with leather, wood and extra brightwork. 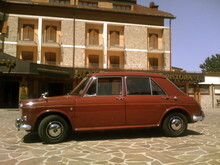 The last true Vanden Plas model was the Allegro based 1500 produced in the mid-1970's. 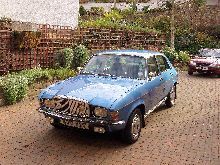 Following the demise of this car the Vanden Plas name was relegated to luxury variants of Austin Rover models and Jaguars. Today the name continues to be used by Jaguar on models for the North American market.